Have You Been Told That One Leg is Longer Than The Other? I remember back in physical therapy school the importance of evaluating and treating people with various problems that were often directly related to poor posture. We remember as children hearing from our mothers and grandmothers to “sit up straight”, or “don’t slouch”. Little did they know that we physically could not do what they wanted us to do. For whatever reason, whether it was tight muscles, weak muscles, crooked spines, long or short legs, we just couldn’t do what they wanted us to do. Then over time, these minor malformations continued to persist and even in some cases worsened as we grew older. The purpose of this article is to provide you with some basic information regarding your body. Most of you have had minor aches and pains, while others may have experienced, unfortunately, more severe injuries. It’s easy to understand when we have a fall or trip and land funny on our knee, or twist our ankle from uneven pavement, but it sure is quite confusing when we awake one day with that little annoying hip pain. The truth of the matter is that the surprising hip pain has been developing for quite some time. It just decided to show its ugly head at this point in time. But why am I having this pain now? I’ve never had this pain before. Why all of a sudden does my hip hurt? I haven’t done anything out of the ordinary. The importance lies within the body’s own adaptive potential. The basic premise here is that the body functions as a single unit with many components. Each component influences and is influenced by other components. Efficient and normal motion occurs from the complex integration of all components. Human movement is achieved through the relationships of the kinetic chain. The kinetic chain includes all bones, muscles and joints of the human body, but more specifically the lower half; the feet, ankles, legs, knees, hips, pelvis, and low back. This linkage system is made up of many component parts, each with their own set of specifications. These specifications are similar to what you might find for certain machine parts. In a way, the human body can be thought of as a machine. However, unlike a machine that is comprised of right angles and nuts & bolts, the human body has the capacity to compensate for a malfunctioning part, and in most cases, in more than one area. The human body seeks symmetry. It will do whatever it takes to achieve that and in doing so will compromise tissue health. In turn, it will wreak havoc on the proper biomechanics of human movement, which will greatly affect performance. The human body is the “great compensator”. It will seek and follow the path of least resistance. The goal of any movement should seek the minimum amount of energy expenditure and maximum joint stability. In human walking, the wide variety of structure and control requires complex integrations for an efficient motor program. The most observable sign of this is a smooth progression of the body’s center of mass during ambulation. Healthy tissue needs force in order to remain healthy. It requires an optimal amount of stress. Too much or too little can be destructive! Remember we talked about how a tissue’s specifications are similar to those of a machine? Well, when a tissue’s tolerance to absorb force is exceeded, tissue breakdown occurs and inflammation and pain follow. When inflammation and pain are present, one’s performance will surely suffer the consequences. One significant condition that impacts healthy tissue is a leg length discrepancy. Oh, but that’s normal isn’t it? Everybody has one leg longer than the other. Don’t they? Sure, not everybody has exact proportional measurements when they compare the right and left sides of their body. First of all, how much is significant? This question has been the source of much debate in recent decades. There have been numerous studies in the medical literature that examined the effects of leg length on various structures, most notably in regards to the lower extremities and the low back. Leg length discrepancies break all of the rules required for healthy joints in the lower extremities and the spine. In response to the asymmetry, muscles will structurally shorten or lengthen to adapt to their new position. There are two types of leg length discrepancies that are present. A structural leg length discrepancy is the anatomical case in which one bone may be longer or shorter than the other. A functional leg length discrepancy refers to the result of something occurring in your body such as a soft tissue contracture or abnormal joint mobility. The most notable functional leg length discrepancy involves the feet. When we say a foot is pronated we mean that it is flat (little to no arch integrity), whereas a supinated foot refers to a foot that has an arch. Generally speaking, a pronated foot creates a short leg, and supinated foot creates a long leg. Of course, during the normal gait cycle, there are appropriate amounts of supination and pronation that must occur in order to achieve efficient and effective ambulation. measurements. Once the proper diagnosis has been made, there are various treatment options that are available. When a structural leg length discrepency is present by itself, the most logical option to equalize the leg length is simply by placing an appropriate lift under the heel or under the entire foot itself, depending on the amount of the discrepancy. Most research reports more than a 1/4 inch difference is pathological. Some studies suggest that even an 1/8 inch difference can be detrimental especially for the running athlete. Running causes the ground reaction forces to increase up to fourfold, as well as, increasing the metabolic demand. The range of motion of all joints increases with greater muscle activity required to control these motions. notably present in which the pelvis may be tilted or twisted in an unusual position. This situation requires manual therapy techniques to align joints properly and to reduce any unwanted muscle activity. In addition to aggressive manual techniques, the use of custom foot orthotics may be recommended in either a structural or a functional leg length situation. Asymmetrical foot function may be causing the leg length discrepancy, therefore appropriate application of an orthotic device will either correct or accommodate to the asymmetry. It should be quite clear that any treatment option chosen must be made only after a thorough examination has been completed. The examination should include an analysis of gait, an assessment of muscle length and strength, joint mobility, and careful evaluation of foot function. >> Click here for Jesse Cannone's Lose The Back Pain System and eliminate your back pain! 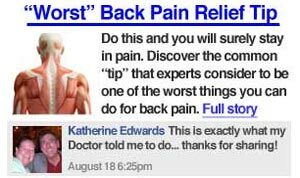 >> Click here to order Jesse Cannone's Lose The Back Pain System and eliminate your back pain!